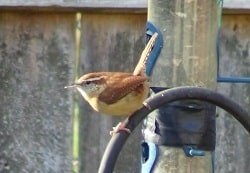 Carolina Wrens, the state bird of SC, are southern birds that do not migrate in the traditional sense. Yet, some younger birds travel northward for unknown reasons and set up residence. Currently its breeding range is a far north as Wisconsin, Minnesota, and southern New England. 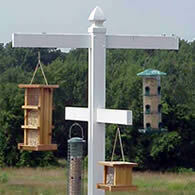 As long as winters are mild, these young birds will build resident populations. If winter becomes severe resulting in food shortages, these birds will perish instead of moving south. This northward cycle would then be repeated over time. A not so common fact about these birds is their ability to mimic the voices of other birds which they do occasionally. But its own voice of tea-kettle, tea-kettle, tea-kettle, Chirrrrrr is well known by friends of this bird. This bird measure 5 1/2 to 6 inches in length with warm brown upperparts and buff-tinged underparts. 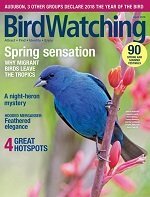 Birdwatchers can look for a bold white eyebrow, white chin and no streaking on back. The white line eyebrow is helpful in correct identification. This white line is an easy way to distinquish it from the House Wren. Carolina Wrens may form pairs at anytime during the year. These pairs tend to stay together as long as both are alive. These pairs will be seen travelling together in throughout their territory. A domed, cup-shaped nest made of twigs, grass, bark, and lined with fine materials. The distinctive side entrance is very helpful in identifying the nest from other bird nest. 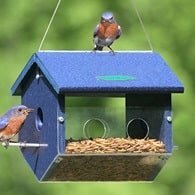 Located anywhere from 1 - 10 feet above ground in almost anything including a tree cavity, propane tank lids, bbq's, man-made bird houses, hanging baskets, and other ornamental types of fixtures. Door wreaths are also common nesting sites. The female lays 4 - 8 eggs that are creamy or pink-white with brown marks. Incubation is done by the female for 12 - 14 days and the young will leave the nest in 12 -14 days after hatching. 2 or 3 broods are raised each season. The breeding season runs from April to July. 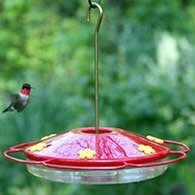 These birds eat insects and small animals such as tree frogs. Also included in their diet is some fruits and seeds. These birds visit my feeders here in Kansas all winter long. They will eat sunflower heart chips, but I've also seen them eating safflower seed and especially suet. 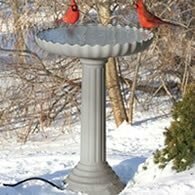 A Heated Birdbath can help provide the drinking and bathing water in both summer and winter. From Hatching To Flight. A friend captured it all in text and pictures.